I would best describe my style as candid and natural, mixing photojournalism with traditional portraiture techniques. My images reflect my love of clean composition and natural light, helping you to look naturally gorgeous! I'll be there to capture everything and yet you often won't notice me there at all. There’s a skill in the balance of knowing when to stay back and capture the candid moments or when to step in and take advantage of great light and shot opportunities. Throughout the day I will capture a mix of candid moments, along with all of those essential shots you want to look back on with your family post-wedding. All of the love, friends and family and lots of laughs. I also love accentuating the natural environment or architecture of the space we're shooting in; paying homage to the wonderful region or venue we're lucky enough to be enjoying on our shoot! Absolutely, I have shot all over the ACT and NSW. Everywhere from Canberra, regional ACT and the Southern Highlands, all the way to Wollongong, Sydney, the Hunter Valley, the South Coast, the Snowy Mountains and even out West! Regional weddings are simply charged at a flat fee on top of standard booking charges. I am yet to be lucky enough to shoot a destination wedding, but I would be interested in negotiating a wonderful rate for international weddings, making it well worth your while! Can we have a second shooter? I have your weddings in very capable hands should you take me on solo. I primarily shoot on my own for the most-part, and I actually think it can be advantageous. For instance, I can more easily mingle and form connections with you and your guests, and I am more absorbed with my work on the day as I don't have to delegate or direct while I'm working. However, if you have a rather large wedding parties or guests counts, or a wedding with location challenges (i.e. large distances to travel between wedding parties), it can be a very good option to employ a second shooter. I simply require as much notice as possible, and I charge this out at an additional $90 per hour, accounting for wages and additional time in post-production. Can we meet with you to discuss our wedding? Yes please! Getting to know my clients and often becoming friends is something that I truly value about my job. What better way than to meet, chat and bond to ensure we're a good fit - and that we have an absolute blast working together! I have become lifelong friends and met some truly amazing people through the process of working together. If you are unable to meet me for a coffee at some point, we could sit down over a wine on the phone, FaceTime or Skype and have a chat about your plans for the day. How many hours coverage will we need? This is different for every wedding. I do offer a 5 hour package which covers essential bride prep through to the bride & groom entrance at the reception. My most popular photography coverage packages are between 8-9 hours which covers both bride and groom prep through to around 3-4 hours at the wedding reception to include the speeches, cake, bridal waltz and even your grandpa busting out some excellent vintage dance moves. Additional coverage is always available no matter how much more you would like covered. I can offer elopement and mid-week mini wedding photography packages which are generally around up to 3 hours of coverage. Do you have a limit to how many images you take on the day? Nope! Every wedding is amazingly different and provides a unique array of shot opportunity; so there is no one answer for how many images I will take or handover. I don't like to budget on shots taken or shots handed over, I just want to make sure I capture all of the essential details and amazing moments that form the story of the day, no matter how extravagant or minimalist they may be. The result is not a quantity of photos, but rather a story of the day. Should we provide you with a meal at our reception? For a wedding package of 5 hours or less, I'm probably all good. However for periods of longer it is very much appreciated when possible. I am known to do my best work on a full stomach after all! Do you shoot LGBTQ weddings? Yes, yes, yes! I strongly believe that love is love and marriage is a right and privilege that everybody should enjoy. As a wedding photographer it was of my utmost desires to see marriage equality happen, and that dream became a reality! I would not only be delighted, but completely honored to capture the amazing moments while you marry your favourite person! We feel awkward in front of the camera - can you help us? I know those feels. It's can feel daunting to be in front of a camera (trust me, I've tried it a few times), but please don't worry. I got you! It's my job to guide you through our portrait sessions in a way that makes you feel comfortable with me, and I'll talk you through posing that's not awkward or unflattering. I will also simply hang out with you - allowing a more natural shoot and together - with your willingness to try and my bad jokes - we will take some awesome photos! You will be guided on how to look your best while we are actually taking the photographs and I don’t generally Photoshop images afterward. My goal is to capture you as your authentic selves. However, if required in post-production I will make minor edits using Lightroom primarily, and occasionally Photoshop tools. I will always make sure that you can't really tell there have been adjustments. I am a firm believer that natural is best, and we are all wonderful just the way we are; so I will not offer major retouching as a standard. I am all about accentuating the best aspects of the shot, which is usually through toning and colour grading. We can talk more about this if you'd like! We're keen! How do we book? Yay! I can't wait to hear from you. Please contact me to either arrange a coffee date or view a copy of my contract. Upon exchange of contract a $1500 retainer is required within 14 days to secure your date. I do not hold dates without an exchange of contract. The remainder of your balance is due 14 days ahead of your event. I absolutely love printing my work for my clients. I offer a range of fine art prints with a beautiful colour profile, archival inks printed on to 240 gsm cotton based canson paper, with a gorgeous watercolour texture. These prints are sure to last a lifetime. 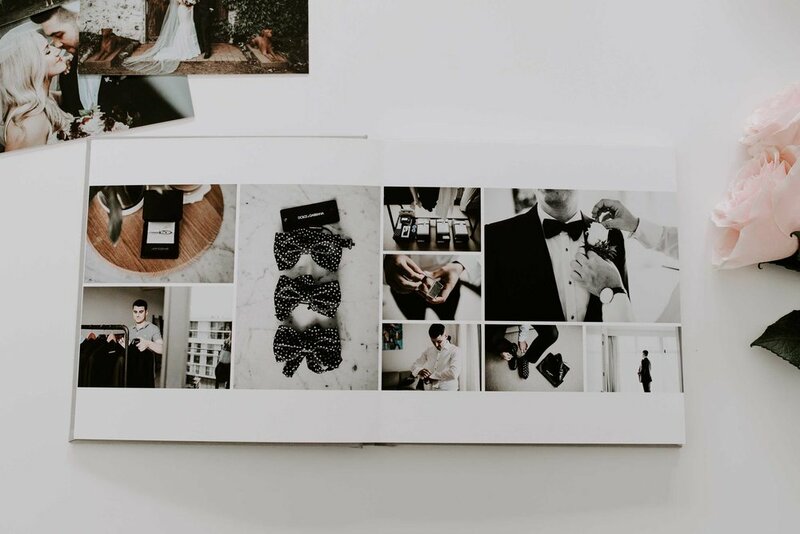 I offer beautiful fine art albums with a story board of your wedding day to a size and specification that suits your personal style. All albums are printed with fine art matte finish paper and archival quality inks. You'll be able to choose your album finishing touches.